Unilever is a global player in the fast-moving consumer goods (FMCG) sector, with nearly a third of the world’s population using its products every day. The company has more than 169,000 employees working around the world, and its leaders estimate that within three years, as many as 60 percent of those employees will be Millennials. 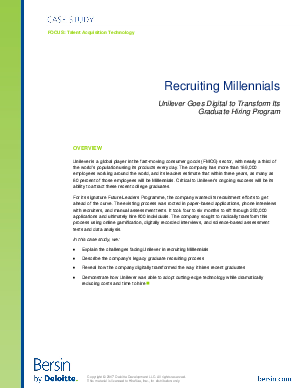 Critical to Unilever’s ongoing success will be its ability to attract these recent college graduates. For its signature Future Leaders Programme, the company wanted its recruitment efforts to get ahead of the curve. The existing process was rooted in paper-based applications, phone interviews with recruiters, and manual assessment tests. It took four to six months to sift through 250,000 applications and ultimately hire 800 individuals. The company sought to radically transform this process using online gamification, digitally recorded interviews, and science-based assessment tests and data analysis.